Various family-related activities had kept me home for a week now, more than I've been used to this past year. I was getting antsy and needed to get out for a hike, even if just for half a day. 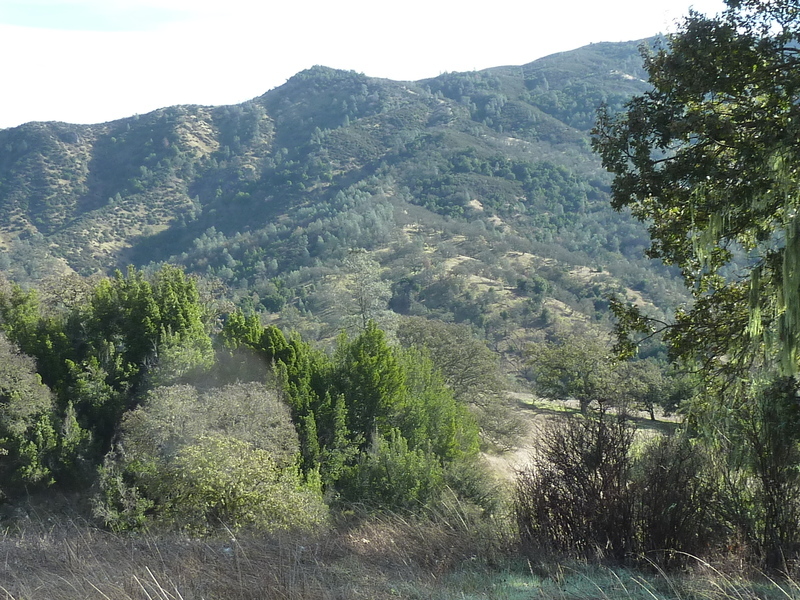 It had been a year and a half since my last visit to Henry Coe State Park in the Diablo Range, one of my favorite local places, so it seemed a good time for a return visit. I wanted to tag Eagle Pines, a named, but minor summit in the interior of the park. At one time it had a healthy stand of pine trees that stood out from a distance but these were wiped out in the 2007 Lick Fire that swept through the park. Very little of the route I used was new as I had already been to nearby Willow Ridge several times in past. I brought the mountain bike to make things easier though I would not be able to use if for the entire route. It was almost 9a when I reached the Park HQ high atop Pine Ridge after an hour's drive from San Jose. The Visitor Center, where I hoped to get change to pay the entrance fee, was closed when I arrived and it didn't look like it was opening any time soon. The fee is $8 but I had only a five and a couple of 20s. As a compromise, I left $5 in the envelope I inserted into the self-pay station, figuring if they wanted the other $3 they could leave a note on my car. I spent almost an hour on the bike, most of this downhill, first descending to Poverty Flat where I carried the bike over the creek. Much of the route is shaded, still wet in many places from a small storm that came through two days earlier. After crossing the creek I rode through the backcountry campground, then up to a saddle just north of Jackass Peak. As has become my habit when going this way, I stopped for the five minute side trip to the top of Jackass Peak. There's nothing special about the peak or the views which are mostly blocked by the oaks and pines that surround it - this was just an easy chance to pad the stats. Once back at the saddle it's mostly downhill to Los Cruzeros, another camp area along Coyote Creek where I parked the bike and continued on foot. I crossed this larger creek without trouble as there's not much water in November, even after a short rain. In February or March this would be a much bigger deal. On the other side of the creek I picked up the Willow Ridge Trail, a single-track that climbs out of the drainage some 1,200ft to the Willow Ridge Road that runs along the ridgeline, continuing to Mississippi Lake another 4mi to the northeast. I stopped at the Willow Ridge HP about half a mile from the junction with the Willow Ridge Trail, then backtracked a short distance to find the Eagle Pines Trail junction, marked by a trail sign. There used to be a road running along this spur ridge to the north, but that has since deteriorated to a trail which in turn has deteriorated to something less. The route is quite overgrown but one can pick up a use trail running along it with only minor bushwhacking. Eagle Pines is located about half a mile from the junction, so thankfully there isn't much of this to deal with.